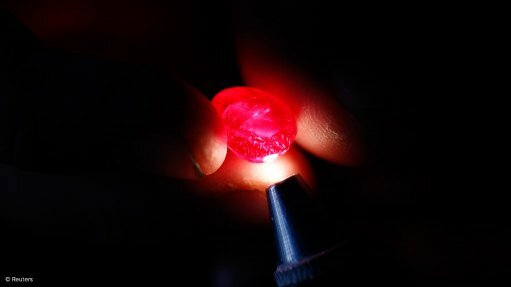 VANCOUVER (miningweekly.com) – Canadian gemstone-focused miner Fura Gems is setting up a single-stop destination in Dubai, where rubies and emeralds produced from its Mozambique and Colombian assets will be graded and sold at the Almas Tower. “The Almas Tower is arguably one of the most secure spaces in the world, from where millions of carats of diamonds and precious gems are sold. Dubai, with its great connectivity, provides an easy access to our clients based in Asia, Europe and Americas,” president and CEO Dev Shetty tells Mining Weekly Online in an interview. He explains that the location offers easy access to a skilled work force, coupled with a world-class infrastructure provided by the Almas Tower, which will help Fura to establish a central hub to create a platform from grading to selling of rough gemstones. Fura also intends to open its first treatment facility for rough rubies in Dubai, which helps to improve the quality of the red precious gems. Founded in January 2017, Fura imminently expects to close a deal to acquire the Coscuez emerald mine, in the Boyacá district, Colombia, which has been the source for some of the highest-quality emeralds in the world for more than 400 years. In October, Fura entered a share purchase agreement with Emporium HS to buy 76% of the issued and outstanding shares of Esmeracol, which owns the Coscuez underground emerald mine. Fura is also looking towards producing rubies in Mozambique, where it has acquired an 80% effective interest in four ruby licences. It has also submitted an application for a further ruby mining licence. “Fura offers investors the opportunity to invest in a rare and exclusive mining sector through a gemstone mining and marketing company, led by an experienced management team, with initial focus on rubies and emeralds. Once our operations are up and running, we will also look at adding diamonds to our product offering,” he advises. Shetty explains that despite the emerald and ruby markets being exceptionally opaque, there is steady demand for both types of precious gems. Prices are on the rise as growing demand from the US and China pushes prices higher. According to Shetty, the global rough gemstone market is worth about $23-billion a year. Shetty says the coloured gemstone sector is led by Gemfields, which owns and operates mines in Zambia and Mozambique, but unlike the highly regulated diamond market, the sector is highly unorganised and fragmented, which is exactly the opportunity Fura intends to capitalise on. He points out that Mozambique is an established producer of high-quality rubies, and has a reputation for quality product among auctioneers and retailers. The ruby market is facing an emerging supply gap, as reserves at the world’s foremost producer – Burma – are being depleted. Meanwhile, a shortfall of supply for sought-after Colombian emeralds is driven by chronic underinvestment by key industry participants. According to Shetty, Fura’s strategy is to invest only in known geologies and precious-gem deposits, in an effort to mitigate the risk of investing in early stage exploration. The team draws on extensive experience in the field. Shetty is a former executive director and COO of the LSE Aim-listed Gemfields, credited with building the world’s largest emerald mine in Zambia and several ruby mines in Mozambique. The team has set itself an ambitious development plan once the Coscuez deal has closed, which is expected to happen by January 20. “I believe the mine has barely been scratched,” he advises. As soon as the deal has closed, the company plans to spend about two to three months upgrading the underground operation’s health and safety culture. It will also take the time to expand the existing tunnels to about three times the current size, to allow modern equipment to reach the mining face in order to validate the current resource models. The aim is to get Coscuez in commercial production under the Fura standard by May. In the long term, Fura plans to gradually modernise the mine to assure consistent supply and it plans to set up a marketing platform to promote Colombian emeralds globally. In Mozambique, Fura is undertaking a 3 000 m drilling programme focused first on secondary mineralised gravels, and also to examine the potential of the primary orebodies at the openpits. The assets are strategically located in Cabo Delgado province, in the Montepuez district, which Shetty regards as highly prospective grounds for Mozambique rubies. The company expects to receive exploration results by early March. Ideally, the company would like to have both the emerald and ruby mines in operation within a 12-month time frame. The rough gems will undergo an initial grading at the Colombia and Mozambique-based mine sites, before being shipped to Dubai for final grading and sales. Backed by Toronto-based Forbes and Manhattan merchant banking group, the company can draw on the group’s extensive experience in the natural resource and mining sector. Many members of Fura’s management team and geological team have followed Shetty from Gemfields into the new venture. “Fura presents a low-risk, low-cost and higher return investment opportunity with a short payback period proposition to investors, by having an experienced management team with a good understanding of mining, geology, distribution and marketing,” Shetty says.